The core objective of any school is obvious: to provide a safe, secure, positive environment in which to enhance children’s learning. Children, teachers, and parents must all feel confident that they are studying, working, and entrusting their loved ones to an establishment that has the infrastructure and technology needed to deliver on this goal. And while a well-equipped school from a teaching perspective is certainly a significant part of the equation, video surveillance and related communications technology also plays a key role. Schools provide some unique challenges in comparison to other working environments. Let’s be honest, the arrival (and departure) of dozens if not hundreds of young students within a few minutes of each other is never the calmest or most organized of activities! It’s important that schools can ensure that only those students supposed to be there are indeed in the school. And anyone who’s spent any time in a school outside the classroom, will know that the day is defined by periods of calm and quiet, punctuated with times of movement, interaction, and high degrees of excitement. Unfortunately, not every interaction between students or, indeed, between students and teachers, is a positive one. Comprehensive, visible video surveillance can not only act as a deterrent to bullying and violence, but can help in identifying where situations are escalating, allowing fast action to be taken. Furthermore, when combined with audio products such as horn speakers, school administrators can communicate quickly and directly with students, diffusing situations, letting people know that help is on the way in case of accidents, or simply making important announcements to give some order to student movements. Looking forward, schools will be able to use their video surveillance solution for applications beyond safety and security; for instance, in response to poor weather conditions, to monitor and optimize energy efficiency, and to improve the flow of students throughout the school. One example of a school that is bringing the benefits of video surveillance to its campus is Rixin Elementary School in Taipei, Taiwan. Though established more than a century ago, the school continues to push forward with a modern technology infrastructure. The school installed a new network video surveillance system, aiming to improve campus surveillance and deliver real-time alerts which would allow security guards and staff to monitor real-time videos easily and react swiftly to any potential incident. As Rixin Elementary School demonstrates, schools of any size can benefit from high-quality video surveillance systems. Axis offers a wide range of solutions, including AXIS Camera Station, which can support the majority of video surveillance needs for smaller and medium-sized educational establishments, and can be integrated into existing security systems. Easy to set up, manage, and operate, AXIS Camera Station is being used in thousands of installations around the world. Find out more about AXIS Camera Station here, and read more about safety in schools here. As you already know, the Reabah family added Teceri in 2014 augmenting the business communication and technology services and solutions we offer. Since then, we have continued to grow and today have dedicated staff, vehicles and a variety of services ready to meet your business’s needs. Teceri integrates with and leverages the networking expertise of Networking Technologies. This provides your business with customized solutions and unified systems that integrate seamlessly. Dan Parra is the Teceri account manager. His sole focus is assisting you in identifying communication technology needs within your business and working with the Teceri team to design a solution that works for you. [You can learn more about Dan in this employee feature.] Contact Dan or your current Networking Technologies sales representative for more information about any of Teceri’s services or to learn more. Dan Parra has made history. In November 2017 he became the first dedicated account executive for Teceri where he will handle all aspects of the sales functions for the newest division of Reabah, Inc. However, Dan’s not new to the organization. Since July 2012, he has held the position of inside sales representative for Networking Technologies where he handled all maintenance and support renewals for customers. Dan was raised in Erie and has been involved in the local hockey community since preschool, first as a player then as both as a coach and an on-ice official. Dan currently serves as Cathedral Prep Hockey’s head coach and has previous been on the coaching staff of Penn State – The Behrend College and Mercyhurst University. He carries success with him – he helped the Division I Mercyhust Lakers clutch the Mid-America Playoff Championship and earn a trip to the NCAA D1 national tournament and coached Prep to the Penguins Cup championship and to the state championship. We know Dan will continue to help coach his customers to winning solutions as well! Dan, his wife, Amanda, and sons, Aidan and Harrison, live in Erie with their two Boston terriers, Frank and Ruby. You can reach Dan at dparra@teceri.com, 814.836.000 x126 or via cell at 814.651.5277. For modern and innovative businesses to grow and globalize, building and maintaining quality relationships with partners, suppliers, internal teams, investors and customers is essential. Utilizing a simple, unified video conferencing solution within your organization not only enables you to communicate just like being there in person (minus the travel expenses), but it also enhances the face-to-face communication necessary for productive and authentic collaboration. Cloud-based video conferencing services make it easy for just about anyone to spin up a trial in their department and get started. But before you do, it’s a good idea to take a moment and get IT involved. Having video conferencing in a tech stack owned and managed by IT can take the service from a department-specific meetings’ feature to a game changer for the organization. Here are the top five reasons why businesses deploy video conferencing and why it’s such a benefit to have IT involved in the decision process. Download the full Why Video Conferencing Belongs In Your Tech Stack Guide to learn more! Whether you are choosing a surveillance system for a primary school, a high school or an institute of higher education, you´ll find an Internet Protocol (IP) solution that fits the bill. IP cameras are increasingly being used in schools and other educational establishments for security surveillance and the remote monitoring of playground areas, corridors, halls and classrooms. Another common use is to offer surveillance as a marketing tool that allows parents or guardians to check up on their children anytime of the day. Outside school hours, the same surveillance system can be used to remotely monitor school property and deter vandalism. A sophisticated, built-in motion detection system can generate an alarm, which automatically transmits images to your security operators giving them accurate, up-to-the-minute information upon which to base their decisions. Students and teachers hampered by the threat of harassment or violence will be comforted by the presence of reliable network cameras in the school´s public spaces. This includes external areas such as walkways between buildings as well as internal ones such as in restaurants and school corridors. Another interesting area of application for this technology is remote learning. A IP video solution can be used to make attending lectures \”at a distance\” a viable option for students who are unable to attend lectures in person. Slim network-run equipment have low maintenance costs and images are stored on computer hard disks, which is a neat, cost effective storage solution. What´s more, since network products make use of modern digital technology, you are sure to get plenty of use out of the investments you make today. Through IP video solutions, it is possible to remotely access a camera over the Internet and view the footage it is capturing from anywhere in the world where there is Internet connectivity. Parents, school principals and owners will always have the peace of mind of knowing what’s happening in and around the school with the learners and staff. IP video surveillance solutions have reached a level of intelligence that was thought to be improbable not so long ago. Active Tampering Alarm is an example of this. It is a feature in IP cameras that enables the detection of disrupted camera operations by automatically alerting the owner by sms when a camera is re-directed, blocked or manipulated. Image quality is arguably one of the most important features of any camera. 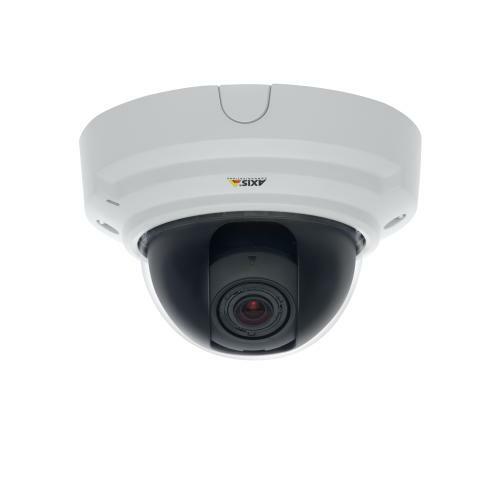 IP cameras have always been known for providing image quality that by far surpasses that of any other surveillance camera. High-end models are now capable of delivering HDTV quality resolution, with day and night functionality enabling these cameras to provide exceptional quality images even of fast moving objects in all lighting conditions – without any motion blur. Most schools are equipped with a surveillance system, however, these are generally legacy systems in need of an upgrade. Whether it is an existing digital IP system or an analogue system that is already in existence, upgrading the system to a fully digital one is cost effective and relatively easy. Both additional IP cameras and existing analogue cameras can be integrated into the system through an IP video server. A recent study concluded that an IP-based system of 40 cameras offers a lower total cost of ownership (TCO) than an analogue-based surveillance system. The study also showed that if a complete IP infrastructure is in place, the IP-based video surveillance system will always cost less. • Teceri News: AV vs IT: Disruption or Evolution? • Equifax Breach: What Should You Do to Protect Yourself? • Are Social Logins Safe to Use? • Why Bother With Updates and Upgrades? discusses “Sharpening the Saw” as seventh habit. He describes this habit as “preserving and enhancing the greatest asset you have—you.” As an organization, we believe it is our responsibility not just to our organization but also to you, our customers, to ensure our team is practicing this habit. To this end, we put a strong emphasis on continuing education and certifications for our entire team, and we love to celebrate these accomplishments. We are in the education business as much as we are in the technology business. We see our job as providing you guidance, information and resources so you can make the best decision possible for your company. To do this, our team has to be on the cutting edge of a variety of solutions and products and demonstrate ongoing competencies in the latest technology and advances in the industry. So, this month, we invite you to celebrate with us in recognizing recent certifications renewed or newly earned by our staff. You can read more about the recent certifications in this month’s newsletter. Also complementing to our team’s expertise is the recent addition Steve Mackrel as System Support Specialist within our Managed Service Practice and the Network Operations Center. Steve’s work ethic, degree in Information Technology, and years of experience in customer service and management make him a perfect fit for our team. Finally, take a minute to read our new Customer Spotlight. This month’s feature focuses on how both Networking Technologies and Teceri have assisted Bonnell’s Auto Group in serving their customers and the Erie community. If you would be interested in having your company highlighted in future editions, please email marketing@net-cloud.com. AV vs IT: Disruption or Evolution? Comparing traditional AV approaches with more IT-style approaches is important in understanding the evolution of content distribution technologies used for video walls and digital signage. A few examples are from Hiperwall technology for illustrative purposes, though the ideas are general enough to apply to other IT-based systems and technologies. The big news this past month has been the Equifax breach. ransom has become wildly successful over the last few years. Waite, Office Manager/HR Administrator, at Bonnell’s recently to talk about their experience.Can you tell me about a few solutions that Networking Technologies and Teceri has offered over the years that stand out to you? Are Social Logins Safe to Use? password combination. The other is the social login, which uses your credentials for a social networking account, such as Facebook, Google+, or Twitter. Until recently the login method you prefer might have hinged on convenience. However, you may want to consider security and privacy before you click that “Log in with Facebook” button again. Don’t collect sensitive information you don’t need. Protect the information you maintain. And train your staff to carry out your policies. The FTC’s Start with Security initiative was built on those fundamentals. It may not be “broke”, but it’s still old. “Working” does not mean “secure”. Did you know with OneNote, you can easily create, revise and share notes — all in one place? OneNote is a great way to collect important information from various sources and organize it for reference later, from thoughts and ideas to homework, meetings, and more! As an organization, we believe it is our responsibility not just to our organization but also to you, our customers, to ensure our team stays on the cutting edge. To this end, we put a strong emphasis on continuing education and certifications for our entire team, and we love to celebrate these accomplishments. We are in the education business as much as we are in the technology business. We see our job as providing you guidance, information and resources so you can make the best decision possible for your company. To do this, our team has to be on the cutting edge of a variety of solutions and products and demonstrate ongoing competencies in the latest technology and advances in the industry. Here are the most recent certifications and specializations earned by our team! regular posts on Twitter, LinkedIn and Facebook. Check us out! Bonnell’s Auto Group has been a long-time customer of Networking Technologies, and after Teceri was established, Bonnell’s was one of the first clients on board, adding digital signage to some of their locations to better communicate with their customers. We sat down with Chrystal Waite, Office Manager/HR Administrator, at Bonnell’s recently to talk about their experience. Can you tell me about a few solutions that Networking Technologies and Teceri has offered over the years that stand out to you? We decided to make a big change in our estimating software a few years ago. This change would merge us from using multiple programs, which everyone was used to, into one, web-based program with cloud storage. So, there was a lot involved with this switch. Networking Technologies walked us through the process and made sure to think of every possible scenario to make sure we are able to stay up and running at all times with no loss of information. We are still using this program and are very satisfied with the outcome. Another example from Teceri happened just this summer. We really wanted to be able to advertise to our own customers, in our lobbies, without having to hang more signs or posters on the walls. We approached Teceri for digital signage solutions. The Teceri staff gave us a really great tour through their facility and explained the many possibilities we had. They use their own products daily, and it was very nice to be able to see how they use it themselves for advertising and employee involvement. We have three kiosks now at a few of our locations running advertising to our customers, and we have ideas for running some signage to our employees in the future. How has your experience been working with our teams? companies, the staff are very easy to work with and always answers our questions very thoroughly. What stands out the most over the years is calling into the support line. Our employees have gotten well acquainted with the support staff, making it very comfortable to call and ask for help. Why did you choose Networking Technologies and Teceri? We were looking for a company that we could count on when we needed urgent matters addressed and a company we could trust to help us select the best quality products that matched our needs, not just a name brand or dollar amount but the best choice for us. What stands out about Networking Technologies and Teceri? When asked for a quote in any service or product, Networking Technologies and Teceri have always made sure to give us more than one option to address our needs and ensure we understand the differences. This is very helpful; these IT choices are usually stressful to make. Also, they offer a lot of services. We don’t necessarily need all of them all the time, but they are great about sharing the information and letting you choose what is best for your company. Using one person for your IT and communication technology needs can be really stressful. If that person is on vacation or out sick, you really struggle to do without that person. When you have a team helping you, like Networking Technologies and Teceri, you’re never on your own! We love working with Bonnell’s to provide customized IT and communication solutions that work for them. Teceri and its solutions in security systems, video conferencing, telephones, network cabling and digital signage, help us better serve our customers by finding solutions that meet even more of their needs. • Is Paying For Antivirus Software Worth It? • What Does Your Business Stand to Lose in a Cyber Attack? In the next few newsletters I will be announcing some exciting changes and additions to our team. This month, I am thrilled to announce that Tom Corapi has taken the position of Solutions Architect for the Erie Region. We feel that Tom’s tenure in working with customers and his knowledge and understanding of the current environment are best suited to maintain and continue to enhance the high level of service our customers have come to expect. You can read more about Tom in this month’s newsletter or on our blog. As part of this transition, we are also excited to announce that Ned Reade, who has been serving as our Erie Solutions Architect, will be serving as the Cloud Practice Manager. In this role, Ned will work with our cloud team to accelerate our cloud offerings with Azure, Office 365, Veeam, Barracuda, AWS (Amazon Web Services), Google Cloud, and Hewlett Packard Enterprise. The cloud is all around us, and we are already living in a cloud world and utilizing its assets – from Office 365 to our phones to other software and systems. While you won’t be able to avoid it, you can “right-size” the cloud to your organization. Some businesses want to (and should) transition 100% to the cloud. Others will operate using hybrid cloud solutions. At Networking Technologies, we truly believe there isn’t one solution that fits all. We work with you on finding the best cloud configuration – compute, storage and network settings – to meet your needs and, in some cases, save you money. You can learn how the cloud can benefit you and read a primer on questions to think through about hybrid solutions. Of course, you can also contact us with your questions or to talk through options. Finally, I know several of you have signed up for our Lunch & Learn: Nimble Storage and Veeam Software event on Sept. 19, from 10:30 a.m.-3 p.m. at Ingram Micro (Williamsville, NY). Join us for lunch, a presentation with live demo and a tour of the Ingram Micro Solutions Center. If you haven’t already, RSVP for the event today. Arizona-based Blue Global operated at least 38 Internet domains with names like 247loan.com, clickloans.net, onehourloan.com, and netloanusa.com. Tom Corapi has been a long-time staple of Networking Technologies, serving as the Server Specialist since 2006 where he implemented and managed virtualization technologies; installed, configured and managed virtual desktop infrastructure technologies; and implemented and maintained enterprise server and storage solutions for clients. Because of his expertise, institutional knowledge, and work ethic, Tom was promoted to Solutions Architect for the Erie region where he will meet the needs of our customers by designing server, storage, and networking solutions. According to Tom his philosophy is “treat everyone with respect and listen to the customer.” The customers he works with will tell you that he works to understand their needs and uses the information to build the best solution possible for them. If an incident occurred on your business’s property, would you have a video recording? If you could retrieve the video, is the quality good enough that you would be able to identify the individuals in the video or clearly make out what happened in the incident? If you’re like some businesses, you use cameras as a deterrent but haven’t updated your business security camera system in years. This leaves you exceptionally susceptible if an incident were to occur. Moreover, you may not realize it, but you’re losing time and money. With analog systems, each camera needs to be individually connected with a coaxial cable and an electrical plug. This drives the cost up and causes many businesses to skimp on using the appropriate number of cameras for their business size. Further costs may be incurred due to the use of DVRs. While this is enhanced technology over traditional tapes, it still adds to the cost. In contrast, IP video surveillance uses the already installed network connection to connect not just one but multiple cameras. Not only does this eliminate the cost of cable and an electrical outlet where the camera is mounted, it also enables an uninterrupted source of power to be used. Cameras can be easily moved to another network jack without the installation costs. Finally, the scalability is endless – instead of having the mandatory 16-channel jumps with DVR, you can scale from one to thousands in increments of one. Your network/IT provider can manage the cameras just like any other device because they have an IP address and are managed via software. Your existing servers, switches and cabling can be used. You do not need an onsite control room allowing multiple locations to be managed from one central control room saving you physical space and potentially human resources. You can check the feed from any Internet connection using authorized access only software. IP networking avoids the “sunset” technology of analog where your device is only able to connect to limited devices and systems. While this pricing strategy for the proprietary CCTV provider works for them – locking you into that company as a single source – it doesn’t work for businesses that want to choose from a variety of cameras and interoperable components from a variety of manufacturers. You can choose hardware, software and other components from one or multiple providers without worrying about compatibility. The security equipment can “talk to” other equipment like lighting, gates and doors. Alarms can trigger the camera to automatically send images direct to a mobile phone or device. Cameras can be set to lock doors, turn lights on or other actions if an alarm is triggered or after some other cue of your choice. You can synchronize data from ATMs, emergency response plans and point of sale systems to search for specific data and view corresponding images. With increased storage, monitoring and access capability, you can utilize your video surveillance system for more than just capturing incidents. The added flexibility of the IP system would allow your marketing department to use it to survey behavior at new point of sale displays, management could review performance to find ways to increase productivity, and real-time streams could provide up-to-date information on traffic patterns allowing enhanced delivery times. One of the best features of IP video surveillance is the enhanced resolution and faster remote retrieval. This makes finding a piece of footage more efficient and identification of what is happening on the video more accurate. One of the other benefits of enhanced quality is the ability for camera intelligence. The cameras can act (sending an alert, locking doors, recording) when it detects motion, a human’s presence, an object being removed, tampering with the camera or identifying an individual from an ID badge. Ready for an IP Surveillance System for Your Business? If you are ready to explore a business security system or you’re ready to upgrade your old, outdated system, let us know. We can perform a security audit and help you choose the best system for your business. Contact us today! Copyright © 2016 Reabah, Inc.